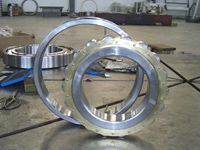 We supply high quanlity cylindrical roller bearings. Roller and Raceway for the line contact, the radial load-bearing capacity is big, and apply to bear the heavy load and shock load. Coefficient of friction small, suitable high-speed, speed limit close to deep groove ball bearings. If you have any needs, please contact us.